Almost two years to the day since we launched our first Blueprint Report, we finally circle back to the core horizontal services function providing the fulcrum for BPO and shared services: finance and accounting. For our 20th Blueprint, authored by analysts Phil Fersht and Hema Santosh, we deliberately focused on the proven "progressive" skills, investments, domain acumen and as-a-service potential of the leading providers in finance and accounting service delivery. So, Phil, what's happening in the F&A space these days? Is the market slowing down as BPO services commodotize? Not at all, one of the reasons why people hear about F&A "slowing down" is the diminishing role of sourcing advisors on F&A deals (only 30% of competitive F&A deals in 2013-14 were advisor-led, and 17% of sole-sourced used a advisor). A third of the deals were also sole-sourced, and very, very few were publicly announced. So the lack of "noise" causes people to incorrectly assume that activity in F&A is slowing down. In addition, we saw a lot more mid-sized businesses take the plunge for the first time, with 55% of F&A deals being signed up companies under $5Bn in revenues in 2013-14 - there have been many non-advisor-led sub-$15m engagements that pretty much flew under the radar in the last couple of years. Net-net, total F&A BPO surpassed $25B in 2014, at a growth rate of 5%, with multi-process F&A BPO reaching $5B for the first time. Multi-process F&A BPO is expected to increase at 9% in expenditure in 2015. But isn't offshoring slowing down? Surely buyers are pulling back from moving F&A delivery into offshore locations? Stories of the demise of offshoring are not only premature, but wildly inaccurate. Our 2014 State of Outsourcing Study asked 312 major buyers of services their 2015 intentions to increase/decreasing offshoring, and close to one in three enterprises will increase their F&A offshore delivery for both outsourcing and (notably) shared services. This is indicative of buyers using their offshore in-house centers to house more controllership / high risk services they do not feel ready to outsource, but want to reduce overhead. Additionally, the increased scope in services that experienced buyers are outsourcing, such as F&A analytics, is increasingly markedly amongst some enterprise clients. However which way you look at it, the offshore component of F&A is almost as popular as IT - and there is no slowdown in sight. While use of robotic process automation is being piloted by several F&A buyers, we're still years away from firms being able to make significant reductions in labor as a results. F&A is a function which has, is and will be - for a very long time to come - dependent on people and talent. While buyers and sellers all want to leverage better tools and tech to streamline delivery and improve digital workflows, the change is more in the nature of work the delivery staff is doing than simply offloading them altogether. The game today is more about working smarter than simply cheaper..
Who's winning the progressive game with the service buyers? The most eye-opening shift has been the steady improvement of both HP and InfosysBPO to join the "Big 4" of Accenture, Capgemini, Genpact and IBM in the Winner's Circle. We also saw real momentum, in terms of innovative delivery, from TCS, Cognizant and Sutherland and steady gains from both EXL and WNS. Accenture breaks new ground with a formal joint venture with its long-standing client, Marriott, to go to market with BPO services to hospitality industry, where F&A outsourcing is a prominent offering. The firm increased its share of the market even further to 30% with its highly successful strategy of expanding its based of large enterprise (diamond) clients. The blending of F&A operations, infrastructure and close alignment with its shared services consulting has the firm leading the market in a time when clients need real consultative support. Capgemini’s flexible, platform-based GEM methodology has all the aspects of progressive delivery covered from the right mix of FTEs, location mix, competency, technology, analytics, and governance. All key Capgemini clients attest real value from the GEM methodology. Capgemini has now emerged as one of the global market leaders with its laser focus and dedication to its F&A business. Infosys scores highly when it comes to the “listening” capabilities of their account management and delivery teams for clients. The firm are frequently cited as being easy to work with and highly responsive to the short- and long-term needs of clients of all sizes. Infy has shown a real hunger to grow their F&A business with multiple recent mid-sized deals that can be scaled in the future and a CEO who clearly sees the value of investing in his BPO business. The recent acquisition of automation tech firm Panaya (see link) could have major impact for clients struggling with ERP strangleholds in F&A. HP has been actively been driving the benefits of deploying robotic process automation for high volume, repetitive, rules-based work, and its AutoFlow tool for workflow meets the needs for clients tired of relying on legacy systems. Its recent number one rating in the 2015 Robotic Premier League is testament to HP’s strong automation focus in F&A. The recent restructuring of HP has been a positive for its F&A business, which has been better exposed to upper management as a genuine area of growth for the firm. Its dynamic ‘Smart’ foundation of Smart Strategy, Delivery, and Design are compelling and transformative, and Genpact's tools have been backed by several customer F&A success stories. Moreover, Genpact is making investments in areas of F&A value to meet the needs of the CFO through its CFO Suite offering, under the leadership of Shantanu Ghosh, which could prove to become a major differentiator for the firm. IBM continues to win over ambitious clients by hosting innovation discovery jams and workshops with its clients to understand pressing needs and create required solutions. 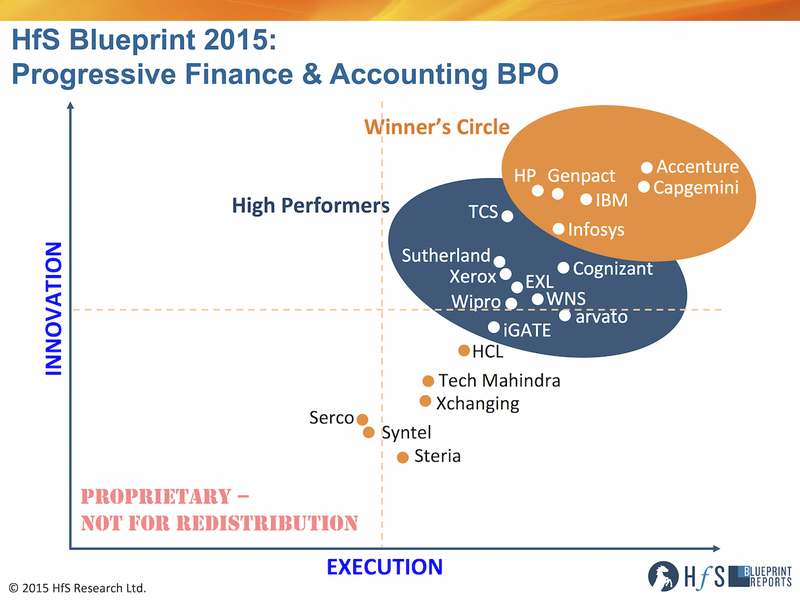 There is strong future potential with its analytics and cloud offerings in F&A BPO. Its recent merging of GBS with GPS (BPO) delivery, could well craft a compelling proposition to the market, under the impressive leadership of Jesus Mantas, who is adopting the term “consult-to-operate services.” Mantas, a transformational consultative leader, understands the value of delivering the entire lifecycle of F&A services to clients – from process design through to managed steady-state. Despite a smaller footprint in F&A BPO, Cognizant’s clients all cite the firm’s desire to move as aggressively as possible to outcome-based delivery of F&A, which is already working very effectively. Well positioned for the As-a-Service Economy and clearly one of the more forward-thinking innovative service providers in business services today. WNS has firmly established itself as a strong “pure play” alternative to some of its larger competitors, winning against the top tier on several occasions. The firm is big enough to deliver and small enough to respond. Has received many positive accolades from many market clients for its hard-work and client focus. Also developing a strong reputation for it's F&A analytics focus. Continues to believe – and invest – in strengthening industry knowledge, and investing in key leaders within industry segments who provide domain intensive guidance. Proprietary TRAPEZE Tools – available both in web-based and mobile versions provide compelling governance support in F&A. Its innovative approach to Robotic Process Automation in F&A has been lauded by some clients and impressed the HfS analyst team (see link). The no-surprise transitions and managing change strategy works well with EXL’s clients. When operations are stabilized over the 12-18 month period, EXL shifts focus with its EXLerator process improvement methodology and collaborates effectively with clients for overall process optimization, target operating model, platform changes, business impact value drivers, and scope shifts. The recent appointment of Henry Schweppe is will help EXL compete for larger, more transformative engagements. So, Phil, what is your prediction for what this market will look like in three years' time? F&A represents the perfect blend of "traditional" labor arbitrage and evolving "As-a-Service" delivery. Nowhere is more ripe for advancements in robotic process automation, analytics and outcomes models than F&A. The winners will be those which can maintain effectively their global delivery scale, but combine it effectively with the As-a-Service ideals, where clients can "plug-in" to the service provider experience, where cloud and automation are at the core of the offerings and designed with these in mind, as opposed to being retrofitted as an after-thought. However, people are still the key ingredient in F&A, and the market leaders are all differentiated not only by the scale - but the skill - of their delivery talent. This market will continue to grow at an annual clip of 5-10% for several year to come - remember, it took the world of finance a decade just to make the jump from Lotus 1-2-3 to Excel. It's going to take a while to get ahead of the As-a-Service curve! HfS readers can click here to view highlights of all our recent 20 HfS Blueprint reports.